BIXOLON provides a Demo App in order to show the concept and the working evidence of our WebApp Print technology. The Demo App is a single package, which consist of four sample applications together (COUPON, QUEUE, EDITOR and COFFE SHOP), using that you can play around our WebApp Print technology. 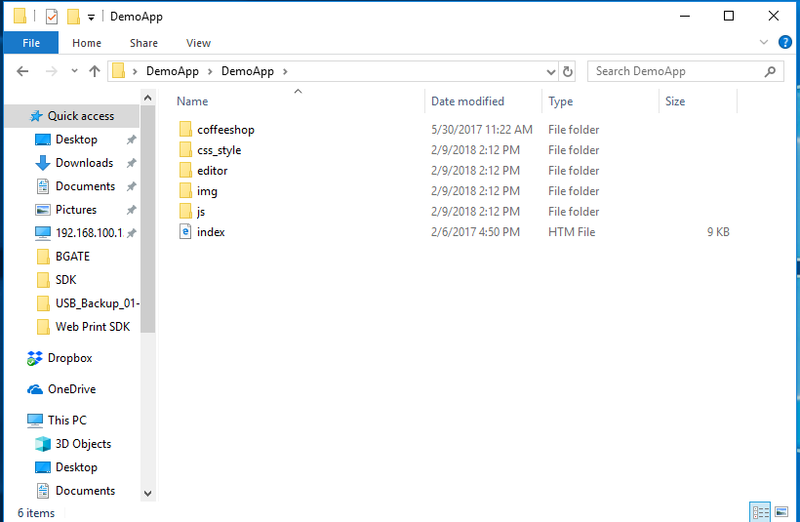 The Demo App consists of 5 folders and 1 HTML file. This folder contains a Sample Coffee Shop Demo Application, you place a sample order and test. This folder contains an Editor Sample application, you can design your own print receipt and test all our SDK API functions. This folder contains the style sheet files, which are used to design this Demo App. This folder contains all the required image files for this Demo App. It’s a main page of this Demo App, this also contains the QUEUE and COUPON sample applications as well. 1. getShopList() – used to get the B-gate Shop Name. 2. getDeviceList() – used to get the printers list, which are connected to the B-gate. 3. makeImage() – used print the Image. 4. makePaperFeed() – used to perform paper feed operation. 5. makePaperCut() – used perform paper cut operation. 6. sendData() – used to send the print data to the B-gate for printing. 3. makeAlign – used to align the page. 4. makeImage() – used print the Image. 5. makeText – used to print text. 6. makePaperFeed() – used to perform paper feed operation. 7. makePaperCut() – used perform paper cut operation. 8. sendData() – used to send the print data to the B-gate for printing. 6. makeBarcode12() – used to print the barcode. 7. makePaperFeed() – used to perform paper feed operation. 8. makePaperCut() – used perform paper cut operation. 9. makeBuzzer() – used to make a buzzer sound. 10. makeDKout() – used for Cash Draw Kickout information. 11. sendData() – used to send the print data to the Cloud Server for printing. 4. makeText – used to print text. 5. makeImage() – used print the Image. 6. makeNVlogo() – used print the NV Logo Image. 7. makeBarcode12() – used to print the barcode. 8. makePDF417() – used to print 2-dimensional PDF417 symbol. 9. makeQRCODE() – used to print 2-dimensional QRCode symbol. 10. makeCmd() – used to print Direct I/O commands. 11. makePaperFeed() – used to perform paper feed operation. 12. makeReinit() – used to reset the print page settings. 13. makePaperCut() – used perform paper cut operation. 14. makeBuzzer() – used to make a buzzer sound. 15. makeDKout() – used for Cash Draw Kickout information. 16. sendData() – used to send the print data to the Cloud Server for printing.